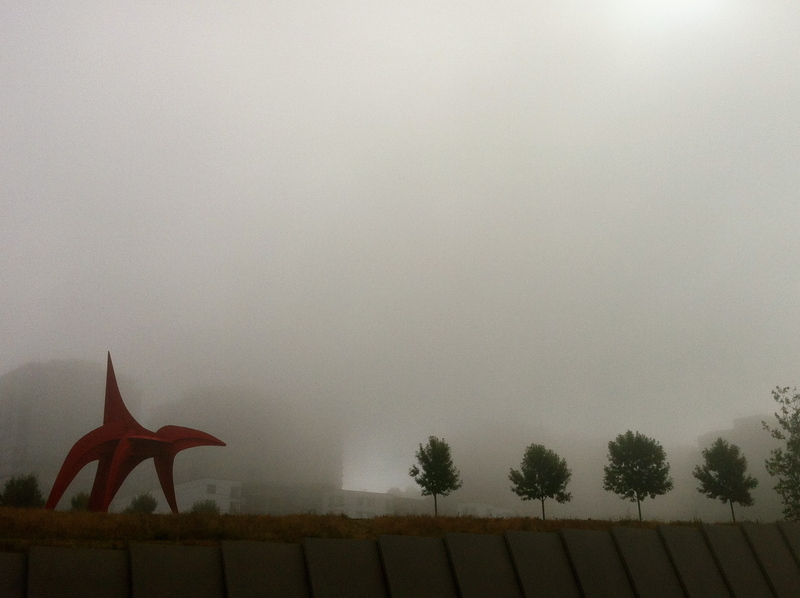 I took this photo yesterday morning, out for a walk in the mist around Seattle’s waterfront. 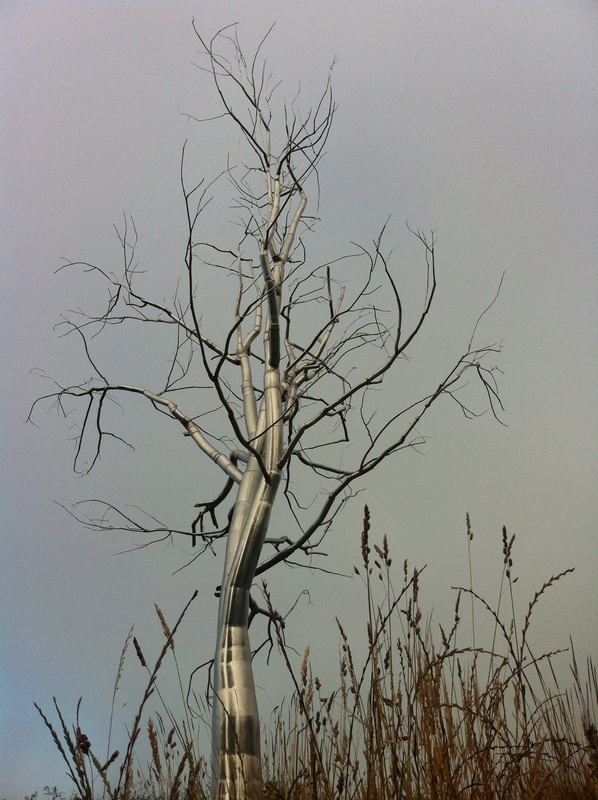 The red pointy thing on the left is Alexander Calder’s The Eagle (painted steel, 1971) next to a few trees planted within the Olympic Sculpture Park. I snapped a picture, cropped it and uploaded it to this page. There you go. Nature: tamed, translated, abstracted and remediated several times over. Something about the abstracted eagle and that carefully planted line of trees reminded me of the new Lorax movie, which I saw last week. [Warning: very minor spoilers] It’s a fable on the distance we’ve come from nature played out through a juxtaposition of real trees and remote-controlled manmade ones; the message being we should stop letting industry fabricate a sellable, apparently controllable nature, and instead just let it grow. And yet, despite this message, it’s told through an odd Dr-Seuss-by-way-of-Pixar fantastic hyperreal style of cartooning. I’m not about to appeal to a knee-jerk critique of postmodernity and plead for a simply really-real depiction of nature. When there was all that fuss about the BBC and polar bears last year, I rolled my eyes at the naivety and largely went with the George Monbiot view. As I argued last month in respects to protest symbols and museum artefacts, sometimes we have to re-make nature to really see it, or at least to share a view of it. Still, the way in which the Lorax movie’s message is presented does inspire a certain type of head-desk. Why not just go outside and get your hands dirty planting something? (arguably because a movie allows the production of consumable goods, but that’s a whole other thread of head-desking). 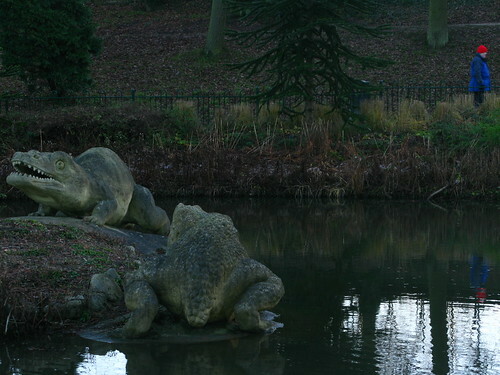 Back to the sculpture park. A bit along from that eagle is a silver tree. I think it is also made from steel, but I couldn’t find a label. It was slightly like a Dr Seuss illustration itself, and eerily beautiful amongst green grass and pink flowers, also in the mist. I saw a crow fly around and then perch upon one of the higher branches. I’m not sure what Dr Seuss would have made of it, something about the sight reminded me of L. Frank Baum. There’s something about trees in cities which says a lot about humans’ relationship with nature in modernity. Planted to provide controlled moments of green amongst browns and greys, they may annoy us with pollen or overgrowing roots but we generally appreciate them. Especially in the case of the London plane, they can be surprisingly study, despite the pollution thrown at them. They give us shelter, shade and air, as well as changing the more regulated colours, lines and shapes of a modern city. As the Trees for Cities campaign argues, cities need their trees. It’s also worth mentioning Seattle’s “renegade park” the Pollinator Pathway – a mile long corridor of gardens aiming to combine art, ecology, science and community engagement – which has a display case just next to that silver tree. If you want something really Seuss-like, in downtown Seattle someone’s painted a load of trees bright blue. 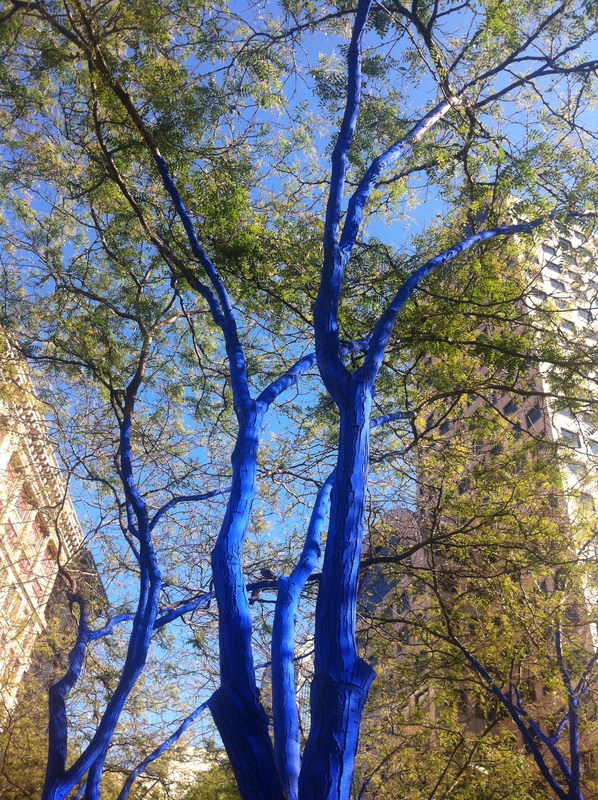 I googled “blue trees Seattle WTF” and discovered it’s more art, designed to draw attention to deforestation. According to a piece on Atlantic Cities, the artist used a colorant that doesn’t harm the trees, even if it’s designed to jar with your idea of a healthy tree (it’s worth clicking the Atlantic link to see a picture of them covered in blossom, quite something, or there’s more on the artist’s website). I’ve saved the best trees in Seattle till last though, and they’re a lot simpler. These were a bit south of the sculpture park, by some rail tracks running alongside the harbour. Someone had hung piping between the trees and stuck a load of plant ports made from old milk cartons to it. Water-cooler sized bottles were stuffed in the trees’ branches, with the pipes running out of their mouths, which I guess provide a watering system of some sort. They aren’t as polished as the silver tree or as striking as the blue ones, but they’re stunningly beautiful and quite the best bit of bunting I’ve seen all year (I live in London, I’ve seen a lot of bunting this year). 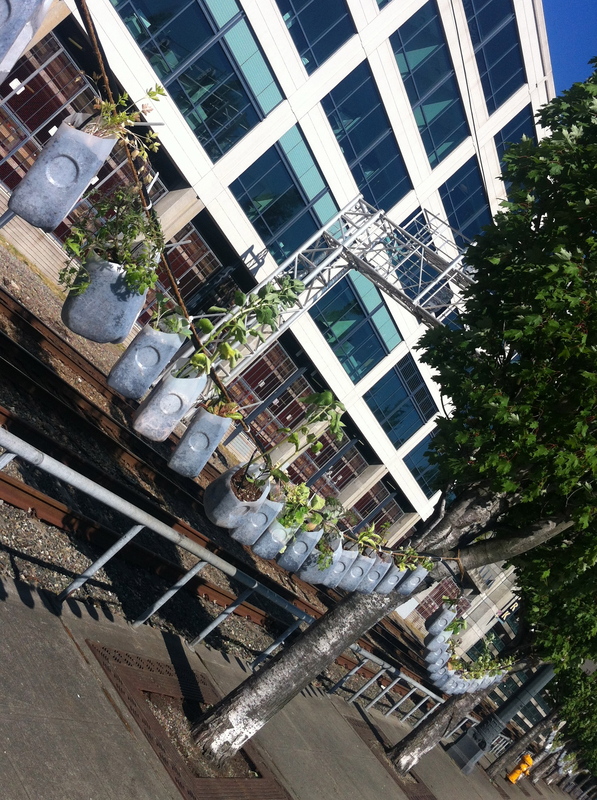 Many of Seattle’s trees made me smile, but these milk-carton plant-bunting ones inspired me. You can watch the oh-too-ironic Lorax movie or you can go out and plant something. Go, try guerrilla gardening. This entry was posted in art, nature and tagged art, cities, films, gardening, nature, realism on July 27, 2012 by alice.